It's time to announce the winner of the Baby Frills giveaway! But first, have you noticed these days on children's teams that we are very careful to let all of the children know that they are winners? On Alex's first t-ball and soccer experiences, there was no score kept, and no losing team. Whatever, I guess that's okay for 4 year olds. But then comes the end of season party, with identical trophies for every member. What's the deal with that? I'm all about making sure kids know that they are worthwhile, valuable, and loved. But how do we really encourage someone who excells, and give the others something to strive for, if everyone gets the same trophy? Alex got a trophy for playing soccer. She played in a month's worth of games and came into contact with the ball once. And it was incidental contact. We even tried to pay her to kick the ball, and that didn't work. Did she really deserve a trophy? Well not on my blog, folks! In the real world, sometimes there are winners. And that means that everyone else is not a winner. Ergo, a loser. then you are a loser. Don't feel bad though! You're in good company. I have entered countless giveaways at The Pioneer Woman's site, and I've been a loser every time. So cheer up! Oh, and congrats Karen! The Random Number Generator at random.org spit out number 22-- and that's you! Simply shoot me an e-mail at eschore@hotmail.com with your full name, address, social security number, date of birth, medical history, checking and routing number, along with the location of any/all birthmarks, and your leg warmers will be on their way! Just kidding about everything after address. Was I a little harsh earlier? I don't want anyone to leave here sad. Oooh. I have an idea! This will make you all happy. Even the losers. Want to talk about losers? I have recently come face to face with an image of myself from the 6th grade. Do you recollect me telling you about my 6th grade self? Think perm, braces, glasses large enough to correct the vision of a dozen people standing behind me, early 90's fashion, and an affinity for breaking out into sudden Steve Urkel impersonations. But at the time I didn't know that. I thought I was okay. I was the furthest thing from okay. But doesn't that make you all feel better? And now, for your good deed of the day-- share this image with a geeky, nerdy, fashion-impaired preteen girl that you might know. Tell her there is hope. Tell her one day she will get contacts. And then Lasik. Tell her her hair will recover. Tell her that she wont always be clad in denim. And then tell her that one day, she too may find a hot fighter pilot to marry and with whom to make babies. But tell her not to show him the incriminating pictures until after the ring is on her finger. Love the picture (can NOT tell its you)! I have one just like it. Not sure if I am brave enough to share. 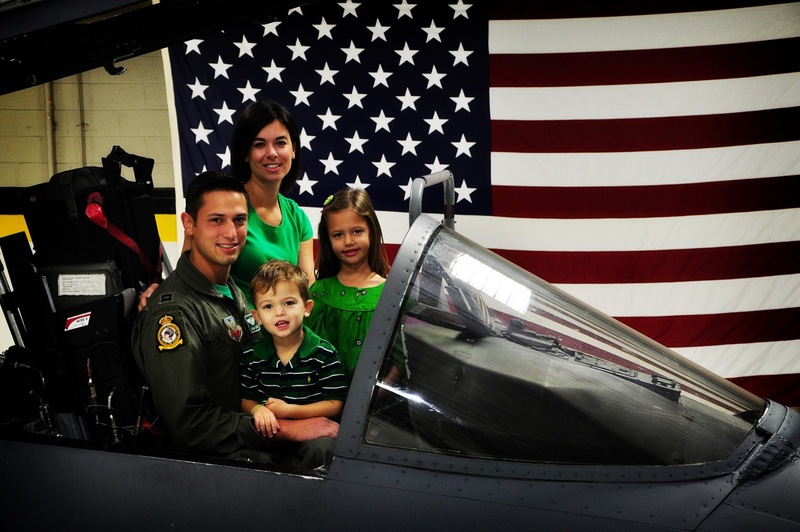 BTW, great family picture! I think I might have picked out that very stunning outfit. A Dads mission is to make his daughters as unattractive as possible to boys in an effort to keep her to himself. Best laugh I have had in a while! Hot Mama!! You looked lovely, I promise. Dude. Your dad reads your blog. I just saw his comment. Time to ix-nay all the ex-say comments. 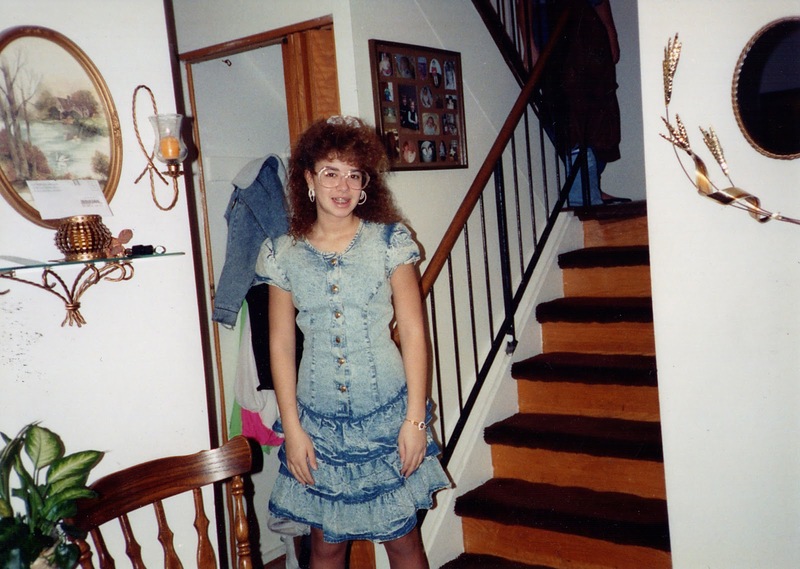 HAHA- that is the funniest picture I've seen in awhile.. you were totally rockin' the acid-washed denim dress. I'm still in counseling for it. Best picture ever. I doubt it's really you though. Sooo, what are you planning for Alex's high school years? Can I borrow that dress for our 80s Christmas party? lol Miss ya, friend! O my word. I forgot dresses like that existed. Acid washed denim, FTW!!! I literally BURST out laughing in my quiet napping house when I saw your picture. Thank you sooo much for that laugh, totally turned my mood around. You are awesome. That dress is not. :) Love ya! This, that, and a cougar.